Sightseeing Boat Tours and Private Boat Charters Lake Geneva Cruise Line offers a wide variety of sightseeing boat tours on Geneva Lake. Tours operate from mid-April through early November. All tours are narrated and offer an up close look at the beautiful and historic estates that line the lake shore. Available sightseeing tours include the famous US Mailboat Tour, Geneva Bay Mansions Tour, Full Lake Mansions Tours, Ice Cream Social Tour and evening Sundowner Cruises. Lake Geneva Cruise Line also offers dining tours including a Luncheon Tour, Sunday Champagne Brunch, Sunset Dinner Cruise and Dixieland Jazz Dinner Cruise. NEW is the BLACK POINT TOUR. Guests will have the opportunity for the first time to tour an authentic 1880�s lake estate. Visitors to the estate are transported by boat as the original estate owners did when the estate was built. Reservations are suggested for all sightseeing tours and are required for all meal tours. Group rates and group packages are available with local restaurants and attractions. All eight boats in the Lake Geneva Cruise Line fleet are also available for private charter. Groups from 2-200 can be accommodated for a casual cook out party or a formal, fine dining experience. Weddings, corporate outings, family celebrations - any event is made more special with the unique setting Lake Geneva Cruise Line provides. Choose a boat that fits your needs - an antique yacht that has cruised the waters of Geneva Lake for over 100 years or the famous Lady of the Lake. Catering, entertainment, beverage service and more is all handled by our experienced charter sales staff. Boat moorings: In and Out service. Riviera Docks, Lake Geneva, Short and Long Term buoy rental. Full service marina selling Cobalt Boats, 18� ski boats available for you to drive, ski school instruction with the latest high-tech �water toys�, private charter service aboard the 58� Diamond Lady for parties up to 50 people, two main fuel docks. Mooring Service: Short and long term buoy rentals or long term slip rentals. In and out service. When it�s time to feed the group, visit Gordy�s Bait Shop for a quick & easy lunch or Gordy�s Boat House, open daily for lunch & dinner. Come to Gordy�s for a night of socializing & dancing in the Sail Loft. Summer is the perfect time to enjoy the Geneva Lake area, and Jerry�s Marine offers the most extensive array of on-the-water fun! If you are looking to either rent or buy a watercraft, Jerry�s Marine can meet your needs. Jerry�s Marine is also a full service marina that offers summer and winter boat storage, seasonal boat slips, certified mechanics, authorized Mercruiser and Volvo service center, complete boat detailing, and used boat sales. Seasonal Shore Stations for rent. Tinus Marine handles pontoon boat rentals for the Oconomowoc, Whitewater and Lake Beulah areas. Pontoon Rental, by appointment only, during hours of operation or special arrangement. Conditions Apply. Call for details. We are located at 503 Wilmot Avenue on beautiful Twin Lakes Wisconsin. We are open from 9:00 A.M. to 7:00 P.M.
We are a full service boat rental and waverunner rental business located in downtown Lake Geneva. Our friendly and personable staff is dedicated to provide the most pleasurable vacation experience possible. Our boats are meticulously cleaned and maintained. We offer a variety of boats and waverunners for rent as well as rides on our 30` Endeavour Catamaran sailboat.Private Charters are available by reservation. A Lake Geneva Tradition for over 27 years! All your water sports needs at one convenient location. Whether you are looking for a relaxing cruise on Lake Geneva or an exhilarating ride across the waves, LEATHERLIPS has it all! We offer a NEW fleet including: 2006 Yamaha VX110 4-stroke Waverunners, 2006 4-TEC Sea Doo Jet Boats, 2006 Bayliner Bowrider Speedboats, 2006 Starcraft Luxury Deck Boats and Honda 4-Stroke Aquatrax. TUBING also available, for ultimate in family fun! All boats come fully equipped with am/fm radios, safety equipment, Nextel Cellular phones, first aid supplies and lake maps. For coupons and specials visit our website below! Instructions and Gas are provided FREE! LeatherLips is open 7 days a week from 9am to 6pm. Driver�s License and Deposit are required. Come down or call for reservations. Look for Green Canopies! WE RENT FUN! Located directly downtown across from The Harbor Shores Best Western. LAKE GENEVA�S LARGEST FAMILY WATERSPORTS CENTER. RATED #1 RENTAL FOR OVER 28 YEARS. Our fleet features award winning Sea Ray inboard/outboard speed boats available in 18, 20� and 22� lengths. Premier Deluxe 12-14 passenger Pontoon Boats, and 4 Stroke VX1100 2007 Yamaha Wave Runners. SKIING, TUBING and WAKEBOARDING also available. Day and night charters provided upon request. New for 2007: Our Wakeboard and Ski School. All boats come complete with GAS, safety equipment, instructions, AM/FM CD stereo sound systems, and map of Geneva Lake. Season - late April through September - seven days a week. Call for reservations. PARKING AVAILABLE. Storage facilities available. Buoys for rent, short or long term. For your choice of water excitement and fun, we rent new Yamaha wave runners, speedboats, and for your larger groups we rent 24� pontoon boats. Tubing and Private Charters are also available. 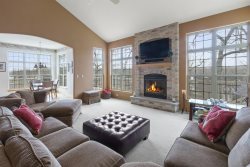 Located on beautiful Button�s Bay (across the street from Big Foot State Park and one mile south of downtown Lake Geneva). Plenty of parking available.